It's Football Season again! The perfect addition to any teams equipment are these heavy-duty Victory Athletic Benches. With sizes up to 20 feet in length, you will have no problem accomodating the entire team in style. Choose from a high-gloss, powder coat finish that will reflect your teams colors & look great on the sidelines. Constructed from heavy-gauge steel that is protected with the exclusive FusionGuard Process, these benches are built to provide years of maintenance-free service. A thick plasticol coating is incorporated into the high-gloss, powder-coat finish which provides an impervious shield to outdoor elements. Plasticol also helps keep surfaces cool in the summer & warm in the winter making them more comfortable than benches without plasticol. 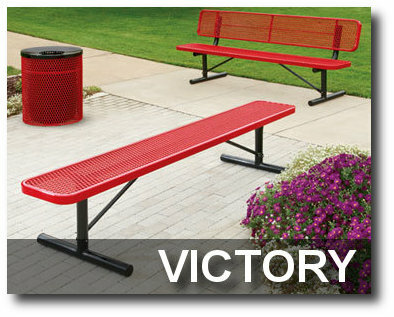 For all of your team seating needs, check out the impressive Victory Athletic Bench Collection available in our catalog!